The tweet by United States President Donald Trump, canceling his meeting with Russian President Vladimir Putin at the G20 summit in Buenos Aires, Argentina, was such a shock for the Kremlin that a response was postponed until “official information” would arrive (RIA Novosti, November 29). When Putin’s aides figured out that it was, in fact official, they pointed to the domestic political situation in the US as the main reason for the non-summit (Rossiiskaya Gazeta, December 1). Trump, however, made it clear that the moment for a meeting was wrong because of the recent escalation in the conflict between Russia and Ukraine (Nezavisimaya Gazeta, November 30). Putin’s inflexible position in this latest crisis shows that his ability to maneuver around military confrontations in order to maximize political gains has, for all intents and purposes, disappeared. The November 25 naval clash around the Kerch Strait was a culmination of tensions that had been building up for months (New Times, November 27; see EDM, November 26, 28, 29). The Russian Black Sea Fleet proved its superiority over two small Ukrainian artillery boats and a tugboat—but at a huge political cost (Ezhednevny Zhurnal, November 27). Most probably, under mounting international pressure, Russia will have to return the Ukrainian sailors and boats, as it did with the Greenpeace activists and their ship Arctic Sunrise after the eco-activists’ 2013 action against the Gazprom-owned “Prirazlomnaya” oil platform in the Arctic (compensation was also paid) (Greenpeace.org, July 18, 2017). Putin could have shown a bit of preemptive benevolence and ordered the release of most of the Ukrainian service members. However, such behavior would have been at odds with the demonstratively tough line set in manipulating the not-so-“frozen” conflict in the Donbas war zone (Novaya Gazeta, November 27). This self-defeating toughness is apparent in many other cases. Moscow has identified strategic stability and arms control as the main theme for long-desired discussions between Putin and Trump (RIA Novosti, December 1). Yet, it remains in categorical denial of any violation of the Intermediate-Range Nuclear Forces (INF) Treaty, which Trump is ready to scrap because of the proven impossibility to convince Russia to return to compliance (Mid.ru, November 26). Russia has no compelling strategic rationale for deploying the 9M729 cruise missile, which is prohibited by the INF Treaty conditions; but the production and rearmament plans proceed (see EDM, November 7) with no regard to the declared commitment to preserving the frameworks of arms control (Carnegie.ru, October 22). Similarly, there was no particular need for Moscow to respond to the North Atlantic Treaty Organization’s (NATO) Trident Juncture 2018 exercises in Norway last autumn with its much larger Vostok 2018 strategic exercises, conducted by the Russian Armed Forces one month prior (Gazeta.ru, November 9). And yet, Moscow went to great length to try to disrupt the NATO activities by announcing missile tests inside the area of exercises, even if no missiles were actually fired (Barents Observer, November 22). Even more disruptive was Russia’s attempt to distort the GPS signal in northern Norway—although Moscow continues to deny any involvement in this cyber-attack (Nezavisimaya Gazeta, November 14). Such aggressive behavior undermines the Russian government’s commitment to developing international cooperation in the Arctic, which Putin will try to reconfirm at the traditional “Arctic—Territory of Dialogue” forum, next spring. In a separate but also informative case, Putin warmly congratulated Russian military intelligence (GRU) on its rather dubious anniversary (Kommersant, November 3), celebrated after months of scandals. This directorate of the General Staff, which used to be proudly professional, has been implicated in multiple awkward cyber-attacks and botched special operations—first of all, the attempted murder of its former colonel, Sergei Skripal, last March (see EDM, March 12, 15, 20, 29). As a result, for weeks a massive cadre purge appeared inevitable (New Times, November 22). But instead, Putin expressed his full confidence in the GRU leadership as well as its rank and file, implicitly assuming responsibility for the uniformed intelligence service’s misdeeds and blunders (Riddle, October 16). It would have served his diplomatic agenda much better to distance himself from such fiascoes as for instance, the coup attempt in Montenegro in October 2016 (Newsru.com, November 22). Instead, his rhetoric seems likely to further encourage the GRU to experiment with criminal activities of unprecedented effrontery. Syria can serve as yet another example of military logic trampling political expediency, particularly as far as the recent confrontation with Israel is concerned. Putin tried to play down the “chain of tragic circumstances” resulting in the destruction of a Russian Il-20M surveillance aircraft, which was hit by a Syrian missile supposedly targeting Israeli Air Force assets (RBC, September 18; see EDM, September 24, 27, October 9). The Russian Ministry of Defense, nevertheless, rejected Israel’s explanations and persisted to cover up its own mistakes with threats of “counter measures” (Novaya Gazeta, September 25). Putin had to concur, and the gears for a next crisis are now in place (Nezavisimaya Gazeta, November 7). What brings all these cases together is the dominant role of the military in determining political choices. 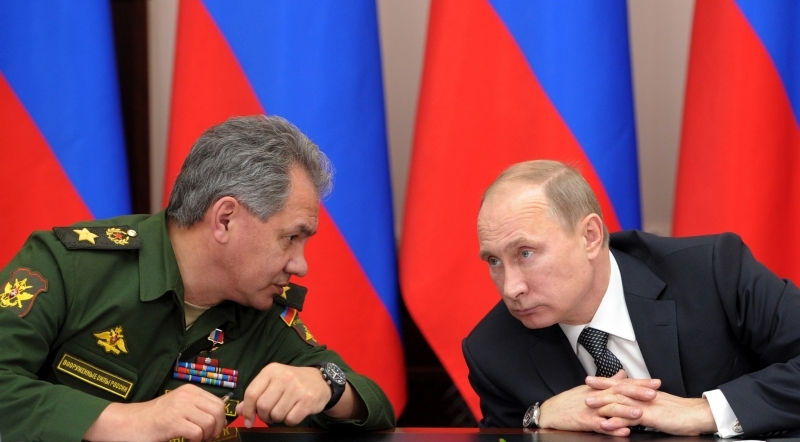 Defense Minister Sergei Shoigu is too experienced a courtier to claim center stage, but he is clearly able to exert more influence than any other member of Putin’s entourage, even without fussy networking in the proverbial Kremlin corridors. The logic of confrontation, in which Russia’s only usable advantage is its readiness to use military instruments of policy, underpins the key role of the top brass, even if Putin has never had confidence in their loyalty. He believes in playing from a position of strength, and the escalating effort at asserting such a position has become the main content of Russia’s policy—though, this reduces his options. The potency of Putin’s personal diplomacy always stemmed from the unpredictability of his aggressive advances and back-pedaling, in moving to another table before the bluff is called. Presently, however, he is caught in a rather inflexible position of having to always demonstrate toughness. Even a symbolic step back becomes an admission of weakness, which is resolutely disapproved of by the military elite. Putin’s court of corrupt bureaucrats and rent-harvesting oligarchs is not infused with the spirit of militarism; yet, it is propelled along the track of confrontation by the fear of losing control over the increasingly discontented country. Military “victories” bring diminishing returns in terms of domestic enthusiasm while attracting punishing penalties from the alarmed West. Still, no substitute for this counterproductive self-assertion is available for the badly mis-governed Russia.